[Adams] Bowen, Catherine Drinker, JOHN ADAMS AND THE AMERICAN REVOLUTION. VG/VG-- Jacket intact with bright colors, but has small tears & chips around all extremities. (No price shown; Book of the Month Club). Book itself is tight and clean. A nice copy overall. (NY: Little, Brown & Company, 1950). Decorated end pages, Four plates, including frontispiece. Extensive notes, bibliography & index, 699 pages. Bennett, David. A FEW LAWLESS VAGABONDS: Ethan Allen, the Republic of Vermont, and the American Revolution. NEW copy, hardcover. (Casemate, May 2014). 6x9, 8 pages of illustrations. 336 pages. ~~~ A Few Lawless Vagabonds is an account of the three-way relationship between Ethan Allen, the Republic of Vermont (1777�91) and the British in Canada during the American Revolution, a work of political and military history. Ethan Allen was a prime mover in the establishment of the Republic (though he was a captive of the British, 1775�78), then led the fight to maintain its independence from the 損redatory states� of New Hampshire, New York and Massachusetts; from the American Continental Congress; and from British attacks on the new state. In order to defend Vermont抯 independence, Ethan Allen engaged in secret, unlawful negotiations with the British in Canada, aimed at turning Vermont into a 搒eparate Government under the Crown.� The attempts of the Allen family to maintain Vermont抯 independence from its neighbors were successful: Vermont became the 14th State in 1791. A Few Lawless Vagabonds is the first systematic attempt, using archival sources, to show that the Allens were utterly serious in their aim to turn Vermont into a Crown colony, a project which came close to success late in 1781. The Ethan Allen that emerges is not as a warrior hero of the American Revolution but as a successful Vermont nationalist who is justly celebrated as the principal founder of the State of Vermont, a rare combination of patriot and betrayer of the public trust. The British leaders who were Ethan抯 opposite numbers emerge in turn as thoroughly capable military officers and diplomatic negotiators: Sir Henry Clinton, Sir Guy Carleton and Sir Frederick Haldimand. Holbrook, Stewart H, ETHAN ALLEN. 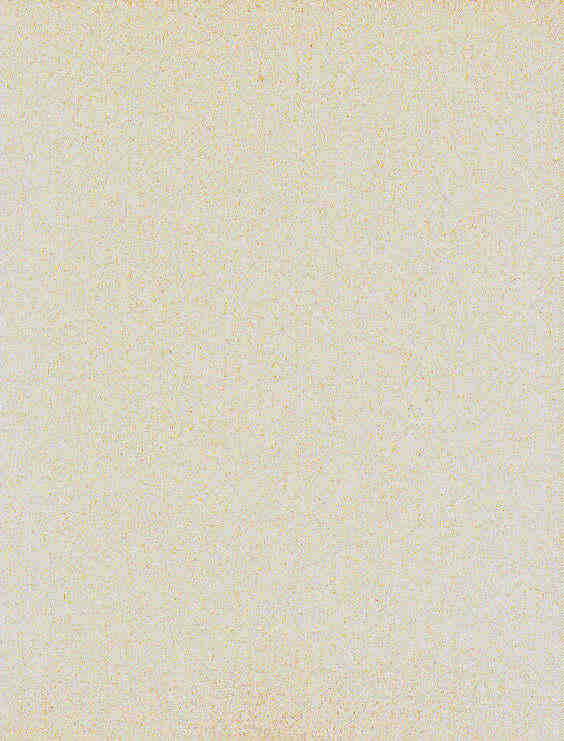 F/VG+ Illustrated, (Bidfords & Mort, 1958). Reprint of 1940 edition. An additional "Note on Editions" by author. Map. Illustrations by Donald A. Baker. ~~~ This copy appears to have come straight out of the distributor's warehouse. There is no shelfwear and the dustjacket is tight, shows no wear, is as bright on the spine as in front, and looks new. The book itself is bright, tight & shows no edgewear. The price has been clipped from the inner flap of the dj, and on the back of dj, where current (1958) titles are advertised, the prices (11 of them) have been neatly marked out with black	magic marker. I have several of these books, and they are all marked in this manner, suggesting it was done by the publisher or distributor. Apart from this flaw, the book is in new condition. ~~~ "...not in the American scene has there been a livelier, lustier character than the late and profane General Allen. As a tosspot none could match him. His humor was often rude, and boundless always. He was a violent enemy, a staunch friend, and ever a highly original thinker. His command of language, including profanity, was so prodigious that many fine examples have been carefully preserved in old records, which seem still to glow with baleful light, such as brimstone makes." Smith, Richard, ETHAN ALLEN AND THE CAPTURE OF FORT TICONDEROGA: America's First Victory. NEW copy, trade paperback. (Charleston: The History Press, 2010). 6x9. Over 45 images. 128 pages. ~~ In April 1775, a small band of men set out from Hartford and traveled swiftly north toward the shore of Lake Champlain, recruiting men to their expedition along the way. Within only a few days, this loyal group of volunteers arrived in Vermont and, joining forces with Ethan Allen and his legendary Green Mountain Boys, launched a daring attack to capture more than one hundred cannons stored at Fort Ticonderoga. In this comprehensive look at 揂merica抯 First Victory,� Richard Smith traces the Patriots� route from Connecticut, through the towns of western Massachusetts and the Berkshire hills and north to Bennington, Vermont, and Lake Champlain. He chronicles the rival expedition led by Benedict Arnold, his confrontation with Allen and the surprise attack that changed the course of the American Revolution. Alotta, Robert I.. ANOTHER PART OF THE FIELD: America's Revolution 1777-78. F/VG. Slight amount of rubbing & cornerwear to dust jacket. Pictorial dustjacket over red simulated-leather boards. (White Mane Publishing, 1991). Maps, plates, endnotes, afterword, bibliography, index, 133 pp. ~~~ Covers the early years of the American Revolution in the Delaware Valley. Originally published at $19.95, now OUT OF PRINT. Harris, Michael C. BRANDYWINE: A Military History of the Battle that Lost Philadelphia but Saved America, September 11, 1777. NEW copy, hardcover. (Savas Beatie, May 2014). 6x9, 10 images, 15 maps. 480 pages. ~~~ "Brandywine Creek calmly meanders through the Pennsylvania countryside today, but on September 11, 1777, it served as the scenic backdrop for the largest battle of the American Revolution, one that encompassed more troops over more land than any combat fought on American soil until the Civil War. Long overshadowed by the stunning American victory at Saratoga, the complex British campaign that defeated George Washington抯 colonial army and led to the capture of the capital city of Philadelphia was one of the most important military events of the war. Michael C. Harris抯 impressive Brandywine: A Military History of the Battle that Lost Philadelphia but Saved America, September 11, 1777, is the first full-length study of this pivotal engagement in many years. ~~~ General Sir William Howe launched his campaign in late July 1777, when he loaded his army of 16,500 British and Hessian soldiers aboard a 265-ship armada in New York and set sail. Six difficult weeks later Howe抯 expedition landed near Elkton, Maryland, and moved north into Pennsylvania. 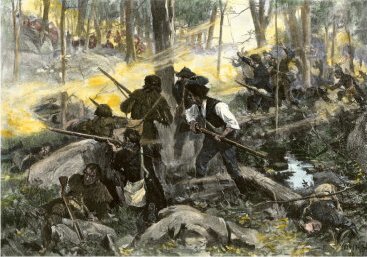 Washington抯 rebel army harassed Howe抯 men at several locations including a minor but violent skirmish at Cooch抯 Bridge in Delaware on September 3. 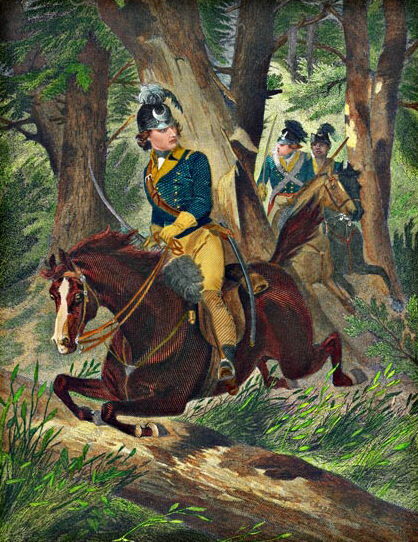 Another week of hit-and-run tactics followed until Howe was within three miles of Chads抯 Ford on Brandywine Creek, behind which Washington had posted his army in strategic blocking positions along a six-mile front. The young colonial capital of Philadelphia was just 25 miles farther east. ~~~ Obscured by darkness and a heavy morning fog, General Howe initiated his plan of attack at 5:00 a.m. on September 11, pushing against the American center at Chads抯 Ford with part of his army while the bulk of his command swung around Washington抯 exposed right flank to deliver his coup de main, destroy the colonials, and march on Philadelphia. Warned of Howe抯 flanking attack just in time, American generals turned their divisions to face the threat. 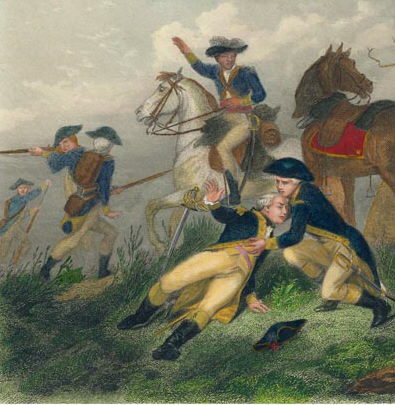 The bitter fighting on Birmingham Hill drove the Americans from the field, but their heroic defensive stand saved Washington抯 army from destruction and proved that the nascent Continental foot soldiers could stand toe-to-toe with their foe. Although fighting would follow, Philadelphia fell to Howe抯 legions on September 26. ~~~ Harris抯 Brandywine is the first complete study to merge the strategic, political, and tactical history of this complex operation and important set-piece battle into a single compelling account. More than a decade in the making, his sweeping prose relies almost exclusively upon original archival research and his personal knowledge of the terrain. Enhanced with original maps, illustrations, and modern photos, and told largely through the words of those who fought there, Brandywine will take its place as one of the most important military studies of the American Revolution ever written." Berger, Carl, BROADSIDES & BAYONETS: The Propaganda War of the American Revolution. VG/VG. (Presidio, 1976). Revised from the 1961 edition. Plates, notes, bibliography, index, 226 pp. ~~~ Carl Berger examines the uses and effects of the multifarious propaganda campaigns during the War of Independence. Unlike previous studies, which have focused only on pamphlets and newspapers, Berger explores a wider realm and assesses the impact of weapons, rumors, bribery attempts, kidnappings and assassination plots. ~~~ Originally published in 1961. This revised edition published in 1976, at $12.95, now OUT OF PRINT. Bonwick, Colin. THE AMERICAN REVOLUTION. NF/NF. Hardcover with dust jacket. (University Press of Virginia, 1991). Maps, tables, documents, notes, bibliography, index, 336 pp. ~~~ Traces the political and institutional development of the United States from the 1760s to the consolidation of federal government during the 1790s. The author argues that the creation of the American republic was a major revolution, and that by the time it was complete, with the Constitution, the United States was radically different from Britain and even from the colonies out of which it emerged. [Boucher] Zimmer, Anne E., JONATHAN BOUCHER: Loyalist in Exile .NEW copy, hardcover with dust jacket, still in shrinkwrap. (Wayne State University Press, Detroit, 1978). Frontispiece, appendices, extensive notes, index, 395 pages. ~~~ Jonathan Boucher (1738-1804) is best known as an imprtant American Tory, one of the few men actively concerned in events leading to the Revolutionary War who developed a comprehensive conservative political phlosophy.... Zimmer's study encompasses Boucher's political theory and also the pioneering lexical research to which he devoted the last years of his life. She includes a complete bibliography of the major sources for Boucher's life, of his published and unpublished writings, and of the important scholarly writing about him." ~~~ Originally published in 1978 at $17.95, now OUT OF PRINT. Nelson, James L. WITH FIRE AND SWORD: The Battle of Bunker Hill and the Beginning of the American Revolution. NEW copy, hardcover. (St Martin's, 2011). 6x9, 2 maps, 384 pages. ~~~ On June 17, 1775, the entire dynamic of the newborn American Revolution was changed. If the Battle of Lexington and Concord was, in the immortal words of Ralph Waldo Emerson, the 搒hot heard round the world,� Bunker Hill was the volley that rocked Britain抯 Parliament and the ministry of King George III to its core. 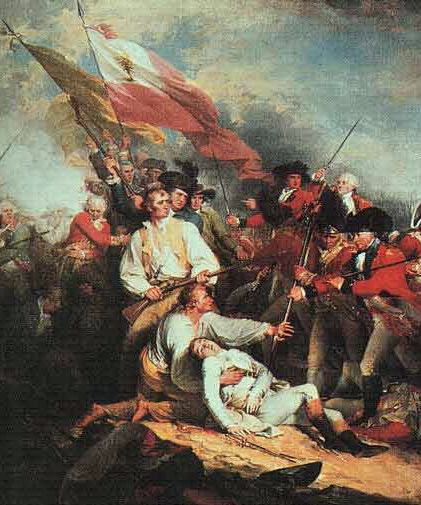 The Battle of Bunker Hill was the first hostile engagement of the Revolution between two organized armies, and the first time that a genuine American army had ever taken the field. It gave the British their first inkling that the Colonial rabble-in-arms they had envisioned might actually prove to be a formidable fighting force. ~~~ In this book, award-winning author James L. Nelson tells the exciting and dramatic story of the fight that changed the face of the American Revolution. He looks at the events leading up to that fateful day, the personalities on both the British and American sides who made momentous decisions, and the bloody outcome of those crucial choices, which would affect the British strategy on the battlefield throughout the coming six more years of active warfare. ~~~ A masterful new history of the first set-piece battle of the Revolutionary War, With Fire and Sword offers critical new insights into one of the most important actions of our country抯 founding. Clarke, Ernest, THE SIEGE OF FORT CUMBERLAND. NEW copy. Hardcover with dust jacket. (McGill-Queen's University Press, 1995). Maps, illustrations, appendices, extensive notes, index, 302 pages. ~~~ Focusing on the revolutionary movement in the Fort Cumberland region of Nova Scotia, this work inquires into why supporters of American independence did not prevail in this British North American colony and how the siege of the Fort shaped the attitudes of Nova Scotians to the revolution. 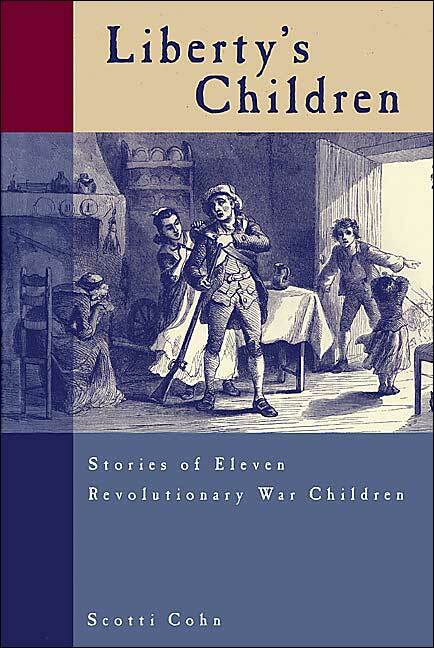 Cohn, Scotti, LIBERTY'S CHILDREN: Stories of Eleven Revolutionary War Children. NEW copy, Trade paperback. (Globe Pequot Press, 2004). Portraits (photos & engravings), bibliography, index, 136 pages. ~~~ Sometimes a war's greatest heroes are its survivors, those who manage to forge new lives despite the tragedy they have experienced. History books usually do not describe how a nine-year-old Massachusetts boy might have felt when his friend was killed in the Boston Massacre or what went through the mind of a teenage Quaker girl when her family fled Philadelphia. Children like these found themselves on the edge of the fray -- both in combat and in the throes of daily life -- helping, or simply enduring, as best their interrupted youths allowed. Their behind-the-scenes stories illustrate what it was really like for children during the Revolutionary War. Meet Frances Slocum, a five-year-old girl captured and raised by Native Americans; James Fortune, a free African American who at the age of fifteen enlisted to work on a government-commissioned ship; and Deborah Samson, who, at twenty, dressed in men's clothes and joined the Continental army. Learn the inspiring stories of American children who displayed courage, devotion, and wisdom during the colonies' fight for freedom. French, Allen. HISTORIC CONCORD AND THE LEXINGTON FIGHT. NEW, hardcover with pictorial dust jacket. (Gambit, Ipswich, 1978, with the Concord Free Public Library. Reprinted from the 1942 edition). 5x7.5. B&W line drawings, color plates, bibliography, index, 102 pp. ~~~ A step by step guide to the battlefields and to the later literary Concord. A handbook of the story of Concord, with an account of the Lexington Fight. OUT OF PRINT. Ryan, D. Michael, CONCORD AND THE DAWN OF REVOLUTION: The Hidden Truths. NEW copy, trade paperback. (Charleston: The History Press, 2007). 6x9. Over 20 images. 128 pages. ~~ Through a series of compelling essays, this book debunks historical myths associated with Concord and the start of the Revolutionary War, and it salutes those who fought for our nation and became the first heroes of the fledgling United States. These accounts of the "shot heard 'round the world" present the realities of the American Revolution. Fleming, Thomas, 1776: YEAR OF ILLUSIONS. NF/NF. (Castle Books, 1996). Reprint of the 1975 Norton edition. Illustrated. Endnotes, bibliography, index. 525 pp. Grant, Alfred, OUR AMERICAN BRETHREN: A History of Letters in the British Press During the American Revolution, 1775-1781. NEW. Hardcover issued without dust jacket. (McFarland & Company, Inc., 1995). Appendices, notes, index, 212 pages. ~~~ "Shows how the British press printed material of genuine significance and that a wide range of political views were expressed." [Howe], Bennett, Charles E. And Donald R. Lennon, A QUEST FOR GLORY: MajGen Robert Howe & The American Revolution. NEW copy, hardcover with dust jacket. (The University of North Carolina Press, 1991). First Edition. Maps, engravings, notes, bibliography, index, 205 pages. 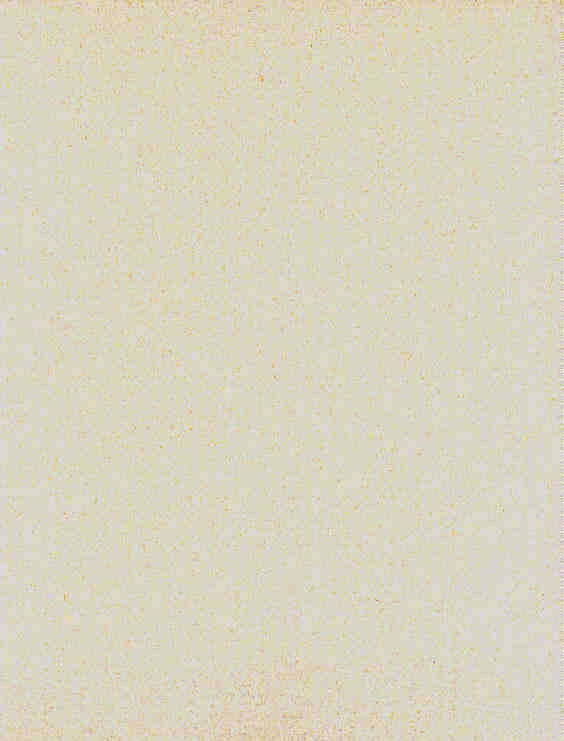 Kennedy, Roger G.. ORDERS FROM FRANCE: The Americans & French in a Revolutionary World, 1780-1820. , NEW. Trade paperback. (UniversIty of Pennsylvania Press, 1990). 9.5x6. Maps, plates, notes, bibliography, index, 526 pp. Dunkerly, Robert M, THE BATTLE OF KING'S MOUNTAIN: Eyewitness Accounts. NEW copy, trade paperback. (Charleston: The History Press, 2007). 6x9. Over 20 images. 160 pages. ~~ In October 1780, American Patriot and Loyalist soldiers battled each other at Kings Mountain, near the border of North and South Carolina. Containing over one hundred eyewitness accounts, this collection is rife with previously unpublished details of this historic turning point in the Revolution. Lancaster, Bruce, AMERICAN HERITAGE HISTORY OF THE AMERICAN REVOLUTION . NEW copy. (American Heritage, 2003). A new edition of the 1958 classic that recreates the bestselling original. Written by Bruce Lancaster, with an introduction by Bruce Catton, and new afterword by Thomas Fleming, the book covers the political, social, military, and economic aspects of the revolution. Illustrations, 8 1/2" x 10 7/8", 384 pp. ~~~ "A magnificent book. The illustrations have been chosen with discernment and an admirable balance has been struck between illustrative and textual material. Bruce Lancaster's text is terse, rapid, lucid and dramatic ... filled with the color and excitement of a grim and bloody war." ~~ New York Times. Simms, William Gilmore, THE LIFE OF FRANCIS MARION. NEW copy, hardcover. (Charleston: The History Press, 2007). 6x9. 256 pages. ~~ Known as the "Swamp Fox," South Carolina's Francis Marion maintained the hope of Patriots in the Southern states in the darkest hours of the American Revolution. In this celebrated volume, the state's greatest author, William Gilmore Simms, traces the life and military exploits of the master of modern guerrilla warfare. With a new introduction by Sean Busick. Miller, John G., ORIGINS OF THE AMERICAN REVOLUTION . VG/Poor. Book in clean, tight condition. Jacket considerably chipped, especially to head and heel of spine. Both flaps nearly detached. Large tear down center of front panel. Jacket in mylar protector. An Atlantic Monthly Press Book. (NY: Little, Brown and Company, Boston, July 1943). Decorated end pages. Decorative drawings by Eric M. Simon. Page-end notes throughout, index, 519 pages. ~~~ "This volume is no rehash of earlier books. Its prime virtue is that it is writte almost entirely from source material, the first time this has been attempted with a subject of such sweep as the American Revolution." 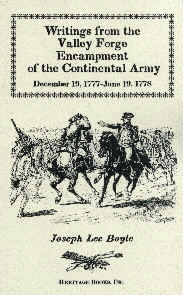 War Bonds stamp printed on back of jacket, with appeal to send the book on to Commanding General, 4th Corps Area Headquarters, Atlanta, Ga., marked "For Army Libraries", "...after you have finished reading this book..."
Cecere, Michael, THEY ARE INDEED A VERY USEFUL CORPS: American Riflemen in the Revolutionary War. . NEW copy, trade paperback. 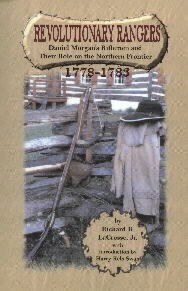 (Heritage Books, 2006). Maps, bibliography, index, 238 pages. [Morgan], Richard B. LaCrosse, Jr., REVOLUTIONARY RANGERS: Daniel Morgan's Riflemen and their Role on the Northern Frontier, 1778-1783. . NEW copy, trade paperback. (Heritage Books, 2002). Illustrated with photographs & drawings, appendices, notes, and list of suggested reading, 221 pages. Introduction by Harry Kels Swan. 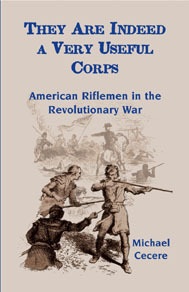 ~~~ Strengthen your understanding of the colonial struggle for independence with this book about the campaigns and exploits of the riflemen during these critical years of the Revolution, with special emphasis on the New York State frontier. Here is the complete account of the riflemen and their weapons; the formation and battle record of this elite regiment; activities in Schoharie, Onoquaga and Unadilla; and during Sullivan抯 campaign against the Iroquois. Biographical sketches detail the careers of the officers and men. Of special interest is an analysis of the myths versus the facts regarding the life of the legendary Timothy Murphy. 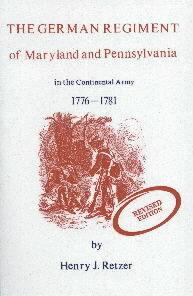 Appendices include a biographical sketch of Captain Jacob Hager; some new research on clothing; dress, equipage and firearms of American rifle officers; monuments, landmarks and historical sites associated with the riflemen; and a muster roll of the rifle corps in 1779. Author-rifleman Richard LaCrosse, Jr. contributes in this essay a vital but forgotten chapter of our national Revolutionary War history. The role of the riflemen on the American northern frontier from 1777 to 1783, a vital segment in our war for political independence from Great Britain, has not been addressed by national historians. The significance of these farm-bred and trained soldiers, who employed American-made rifles in winning the war along this northern frontier, can now be assessed by students of our Revolution. In this splendid essay, author LaCrosse has contributed a readable and accurate portrait of a little-known and less appreciated segment of the American Revolution. 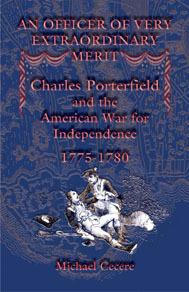 [Porterfield], Michael Cecere, AN OFFICER OF VERY EXTRAORDINARY MERIT: Charles Porterfield and the American War for Independence: 1775-1780. . NEW copy, trade paperback. (Heritage Books, 2004). Maps, bibliography, inex, 180 pages. ~~~ Charles Porterfield was one of many Virginians who helped secure America's independence. 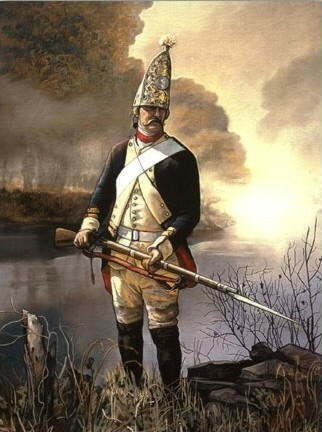 He served in Daniel Morgan's rifle company at Boston and Quebec. He commanded a company in Morgan's 11th Virginia Regiment as well as William Maxwell's Light Infantry Corps. 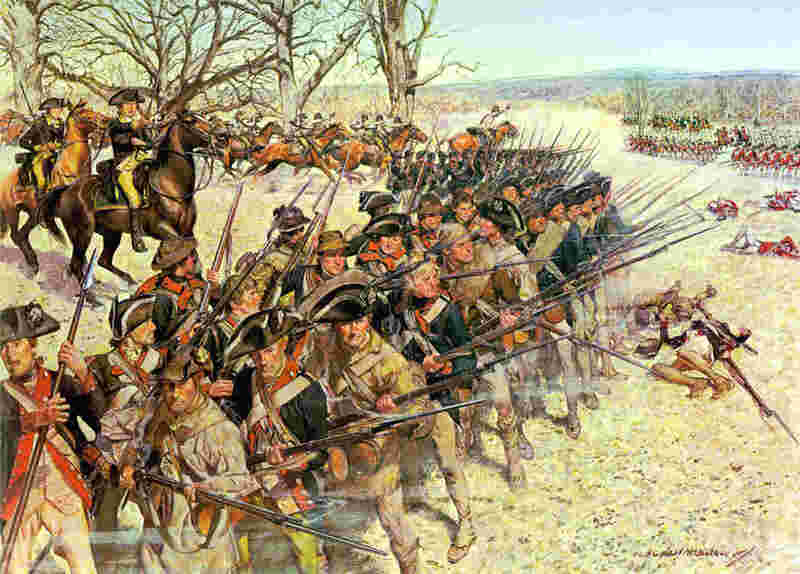 Porterfield fought in the battles of Cooches Bridge, Brandywine, Germantown, and Monmouth, and endured the hardships of Valley Forge. He returned to Virginia in 1779 and served as a Lieutenant Colonel in the state garrison regiment. In 1780, he led a relief detachment to South Carolina and initiated the Battle of Camden. The distinguished service of Charles Porterfield and his men is chronicled through numerous first person accounts. 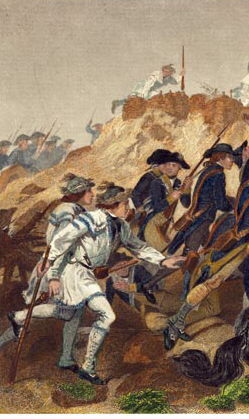 The excitement caused by the riflemen at Boston, the grueling march through the wilderness of Maine, the storming of Quebec in a blizzard, the action at Cooches Bridge, Brandywine, Germantown, the hardships at Valley Forge, and lastly, in one of the best first person narratives of the Revolutionary War, the early morning engagement between Colonel Porterfield's and Colonel Tarleton's advance guards at Camden, are all vividly described in the book. Charles Porterfield, and the men he served with, endured much for the cause of liberty. Their service is remembered here, in their own words. Morison, Samuel Eliot, THE CONSERVATIVE AMERICAN REVOLUTION. NF. Issued without dust jacket. (The Society of the Cincinnati, 1976). The Inaugural George Rogers Clark Lecture, 22 April 1975. A handsomely-printed & bound little book, on heavy, laid paper. Frontispiece photograph, notes, index, 42 pages. 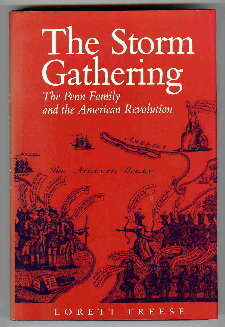 (Penn), Treese, Lorett, THE STORM GATHERING: The Penn Family & the American Revolution. NF/VG+. Slight crimping to dust jacket at top of spine. (Pennsylvania State University Press, 1992). Plates, appendices, notes, bibliography, index, 245 pages. ~~~ Focusing on Thomas and John Penn, this book presents the first study of what happened to Penn's proprietorship after his death, tracing the role of his descendants in the advent of the American Revolution. 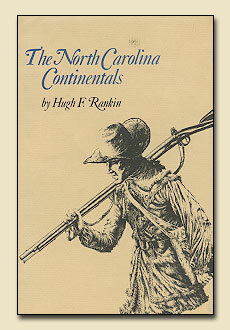 Rankin, Hugh F., THE NORTH CAROLINA CONTINENTALS. Fine/Fine, as NEW copy, hardcover in unclipped dust jacket in mylar protector. (University of North Carolina Press, 1971). Extensive page-end notes throughout, bibliography, index, 428 pages. ~~~ In this thoroughly researched and well-written account of the experiences of the North Carolina Continentals, Rankin provides one of the very few good studies of the Continentals in individual states. Chapter 1 is a superb narration of the events leading to war in North Carolina. 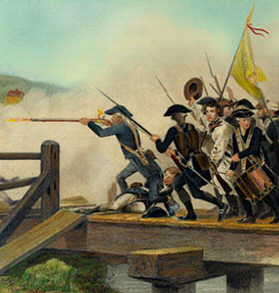 Chapter 2 represents the only complete account of the famous Battle of Moore's Creek Bridge on April 12, 1776. Succeeding chapters deal with all the campaigns and battles in which the N.C. Continentals took part: Brandywine, Germantown, Charleston, Savannah, Camden, Eutaw Springs, and others. The chapter on Guilford Courthouse is one of the fullest records of that significant battle to be published to date, and the chapter on Valley Forge is one of the most interesting descriptions of the sufferings of Washington's army during the winter of 1777-78. ~~~ Originally published at $12.50, now long-since OUT OF PRINT. 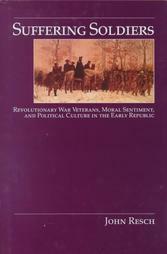 Reich, John Phillips, SUFFERING SOLDIERS: Revolutionary War Veterans, Moral Sentiment, and Political Culture in the Early Republic. NEW copy. Hardcover with dust jacket. (University of Massachusetts Press, 1999). Illustrations, appendices, notes, bibliography, index, 336 pages. ~~~ A study of how the moral sentiment of gratitude, as expressed in the image of the suffering soldier, transformed the memory of the Revolutionary War, political culture, and public policy in the early American republic, legitimizing the army as a republican institution and crediting it with securing independence. Retzer, Henry J., GERMAN REGIMENT OF MARYLAND AND PENNSYLVANIA. . NEW copy. Trade paperback. Heritage Books, 2000. Revised Edition. Index, 183 pages. 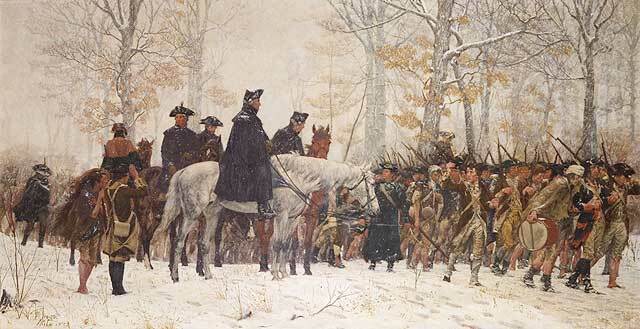 ~~~ This work brings "a little known unit of Gen. Washington's army some recognition." From a variety of federal and state records, plus personal journals and letters, a sometimes hazy, sometimes clearer picture emerges. This new revised edition includes twenty pages of additional information recently uncovered by the author. The index has been revised to include this new information. Full name index. 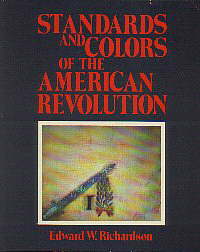 Richardson, Edward W. STANDARDS AND COLORS OF THE AMERICAN REVOLUTION. NEW copy, hardcover with dust jacket. (The University of Pennsylvania Press and the Pennsylvania Society of Sons of the Revolution and Its Color Guard, 1982). First Edition. Generously illustrated with b&w drawings & full-page color plates. 341 pages. Holmes, Timothy & Libby Smith-Holmes, SARATOGA: America's Battlefield. NEW copy, trade paperback. (Charleston: The History Press, 2012). 6x9. Over 65 images. 192 pages. ~~ Widely recognized as the turning point of the American Revolution, the battles of Saratoga saw British general Burgoyne fall to Washington抯 fledgling Continental forces. This victory not only convinced the French to enter the war but also thwarted Burgoyne抯 efforts to split New England and cut off the colonies. In the years afterward, Saratogians took pride in what had unfolded in their backyard. Memorializing, preserving and celebrating the battles are part of Saratoga抯 heritage, before and after Franklin Delano Roosevelt helped it become a national park. Discover here the story of the battles of Saratoga and the life of one of the most important battlefields in America. 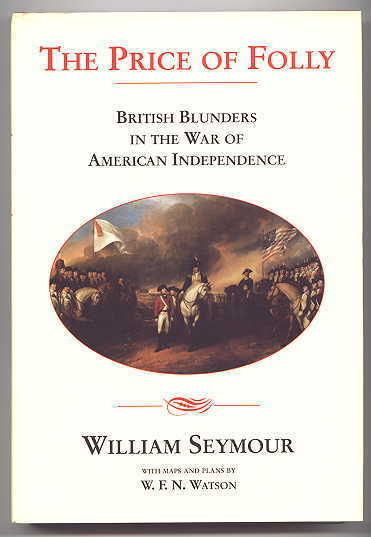 Seymour, William, THE PRICE OF FOLLY: British Blunders in the War of American Independence. NEW copy. Hardcover with dust jacket. (Brassey's, 1995).7x10. Maps, notes, bibliography, index, 271 pages. (Stephen), Ward, Harry M., MajGen ADAM STEPHEN & THE CAUSE OF AMERICAN LIBERTY. NEW copy, still in shrinkwrap. Hardcover with dust jacket. (University Press of Virginia, 1989). 314 pp. 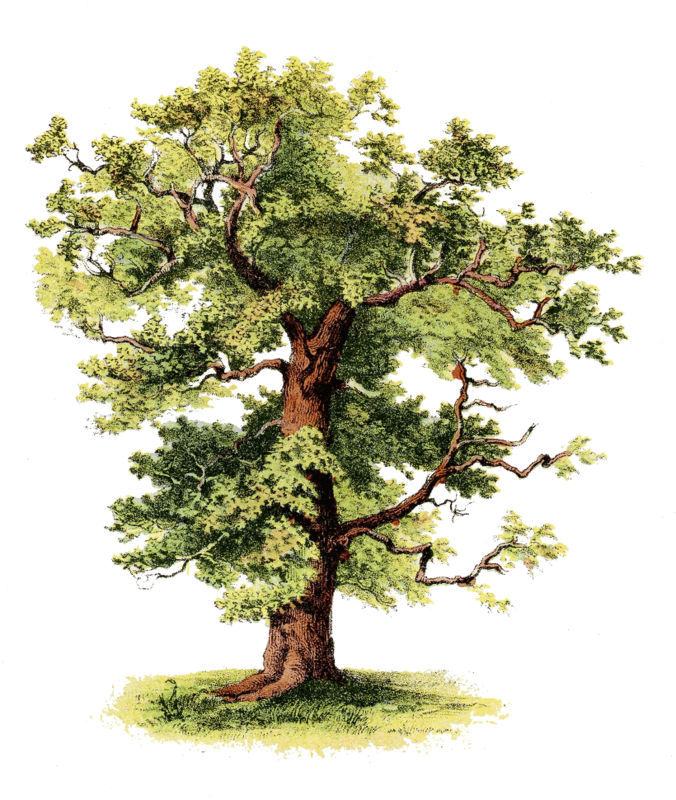 ~~~ Traces Stephen's multi-faceted career as Virginia planter, industrialist, physician-surgeon, politician, public servant, and military officer at one time second in command to Washington. Boyle, Joseph Lee, WRITINGS FROM THE VALLEY FORGE ENCAMPMENT OF THE CONTINENTAL ARMY, DECEMBER 19, 1777 - JUNE 19, 1778. Volume I. . NEW copy. TRADE paperback. Heritage Books, 2004. Indices, 176 pages. 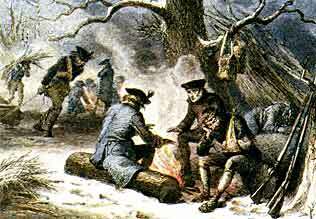 ~~~ "Hundreds of letters and documents written at Valley Forge have been published in collections that represent the best remembered men of the Revolution. There are also documents of uncounted numbers by lesser officers and staff functionaries that have never been published, or have been printed long ago and are no longer readily available. The intent of this effort is to present a selection of these, as the first of several such volumes, to allow greater understanding and appreciation of the Valley Forge Encampment. A brief introduction describes the events that led to General George Washington's decision to encamp at Valley Forge. During the six months spent there, the Continentals suffered for lack of shoes, blankets, clothing and food, and complained loudly of tardy and insufficient pay. 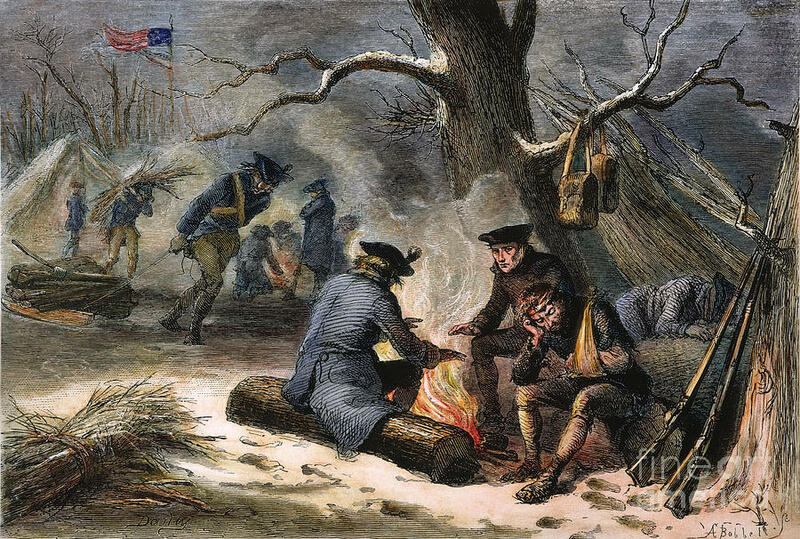 The garrison at Valley Forge was at odds with local people who traded with the British forces occupying Philadelphia, while the officers in camp bickered among themselves. The men also celebrated when they heard news of American victories and the signing of the Treaties of Alliance and Commerce with France. Camp rumors occasionally spread, but the arrival of Friedrich von Steuben instilled a new discipline which boosted the general morale and dramatically improved battlefield deployment. Documents are arranged chronologically, and the original spelling and punctuation has been retained. A descriptive note at the foot of each entry gives the source location of each document, and identifies the writer and recipient the first time each individual appears. The author scoured the National Archives and more than 20 other state archives, university libraries, and historical societies in his search for these rare papers. Greene, Jerome A. THE GUNS OF INDEPENDENCE: The Siege of Yorktown, 1781. NEW copy, trade paperback. (Savas Beatie, 2009). 6x9, b/w maps and photos, 528 pages. 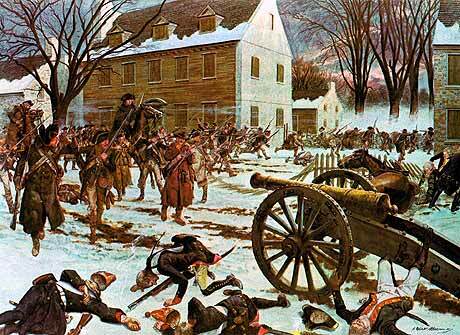 ~~~ The siege of Yorktown in the fall of 1781 was the most decisive engagement of the American Revolution. The campaign has all the drama any historian or student could want: the war抯 top generals and admirals pitted against one another; decisive naval engagements; cavalry fighting; siege warfare; night bayonet attacks; and more. Until now, however, no modern scholarly treatment of the campaign has ever been produced. 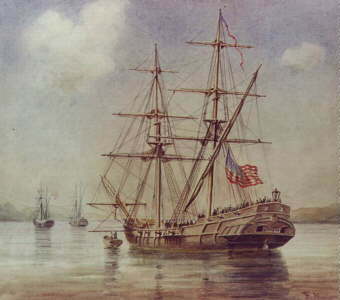 ~~~ By the summer of 1781, America had been at war with England for six years. No one believed in 1775 that the colonists would put up such a long and credible struggle. France sided with the colonies in 1778, but it was the dispatch of 5,500 infantry under Rochambeau in the summer of 1780 that shifted the tide of war against the British. 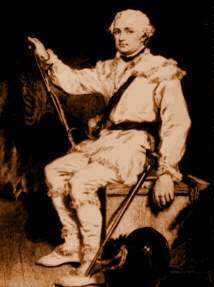 ~~~ In early 1781, after his victories in the Southern Colonies, Lord Cornwallis marched his army north into Virginia. He believed the Americans could be decisively defeated in Virginia and the war brought to an end. George Washington believed Cornwallis抯 move was a strategic blunder, and he moved vigorously to exploit it. 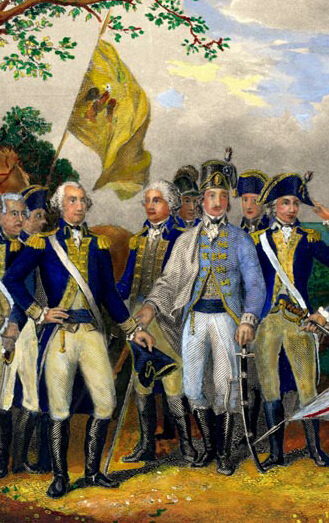 Feinting against General Clinton and the British stronghold of New York, Washington marched his army quickly south. With the assistance of Rochambeau抯 infantry and a key French naval victory at the Battle of the Capes in September, Washington trapped Cornwallis on the tip of a narrow Virginia peninsula at a place called Yorktown. And so it began. ~~~ Operating on the belief that Clinton would arrive with reinforcements, Cornwallis confidently remained within Yorktown抯 inadequate defenses. Determined that nothing short of outright surrender would suffice, his opponent labored day and night to achieve that end. Washington抯 brilliance was on display as he skillfully constricted Cornwallis抯 position by digging entrenchments, erecting redoubts and artillery batteries, and launching well-timed attacks to capture key enemy positions. The nearly flawless Allied campaign sealed Cornwallis抯 fate. Trapped inside crumbling defenses, he surrendered on October 19, 1781, effectively ending the war in North America. ~~~ Penned by historian Jerome A. Greene, The Guns of Independence: The Siege of Yorktown, 1781, now available in paperback, offers a complete and balanced examination of the siege and the participants involved. Greene抯 study is based upon extensive archival research and firsthand archaeological investigation of the battlefield. This fresh and invigorating study will satisfy everyone interested in American Revolutionary history, artillery, siege tactics, and brilliant leadership.